Ceiling fans are commonplace throughout the South, as our Summers are harsh and long. There are several advantages that having overhead fans throughout your home. The best reason to have a ceiling fan is to keep the room cool. If you use a fan in conjunction with an air conditioner, you could save money on your electric bill. Fans can reduce the temperature in a room by a substantial amount and they do not cost anywhere near what it costs to run an air conditioner. Ceiling fan installation can be complicated and dangerous. What seems like a simple task can easily turn into an all-day affair. If your fan is not installed properly, you could put your family in danger! 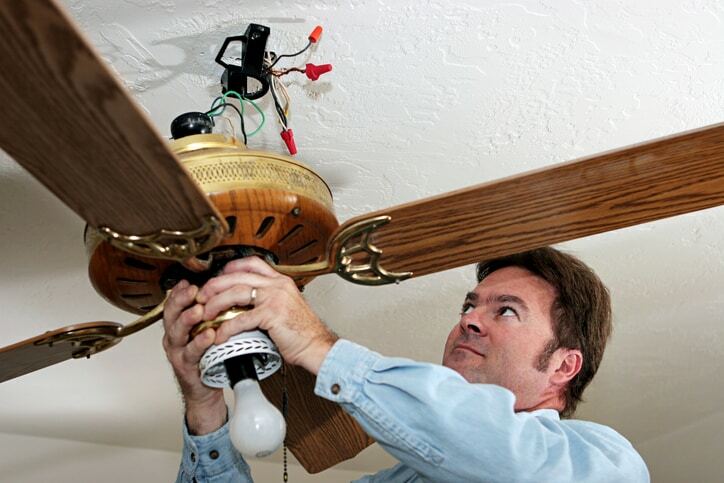 Let our licensed, bonded, and insured electricians help you with your ceiling fan installation. At Speedy Electric & AC, we have properly wired countless homes for ceiling fans. We perform expert installations that meet safety codes to protect you from accidents and fires. We always use accurate technical practices during wiring and installation.